Anyone who knows anything about Christmas knows that Mainlining Christmas is the only site on the internet that truly encapsulates the holiday in its entirety. Normally, I wouldn't think a statement so manifest by the unnatural light of a million multi-colored bulbs would require further explanation. But apparently, I'd be wrong. Because, apparently, we're not the only ones laying claim to Christmas. Recently, I came across Christmas.com. The bottom of their page proclaims, "Christmas.com is the Official Website of Christmas 2012." First off, who the hell approved that? Do they have a notarized letter of permission from Jesus? You'd think something like that would belong on their About Us page, and I just checked: it's not there. I guess they feel comfortable backing up that claim. So let's compare content. 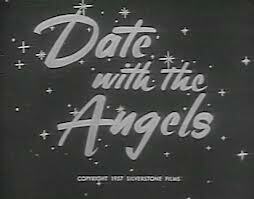 I knew that this show existed, although I don't recall ever seeing an episode before. It's odd, but kind of charming. From what I gathered of the premise, Holmes has been awoken/resurrected in the far future, Captain America style, except with even more super-science. 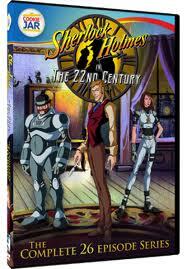 Watson is rebuilt as some kind of robot, and the new Lestrade is a lady cop. I liked her, she seemed to be the muscle. Overall I enjoyed this. It had some awkward made-for-children 'humor' and some cut corners in production here and there, but as a rather unique version of Holmes, I'm actually really on board with this. The tone of the setting was really interesting, and the whole pastiche seemed to be right on the best line between taking the source material seriously while being delightfully tongue in cheek when appropriate. Every day at midnight between December 1st and December 25th I'll be posting genre fiction about Christmas Eve. The first installment is a short science fiction piece. Even before he lays a finger on the small, wrapped box, Charles Windmire knows precisely how it will feel. He is surprised by this, at least in part. He’d expected a sense of nostalgia, being here, being now, but this transcends that. He knows the texture of the gold paper and the way the soft fabric beneath it will give the tiniest bit when he squeezes it. He knows the how firm the gift tag is, just as he knows what’s printed on it. The irony is not lost on Charles as he lifts the box from its spot beneath the tree. And looks at it. All, just as he remembers. It isn’t happening once, but many times. He feels dizzy and sits down. Remember two years ago when I wrote five short stories for the blog in the midst of trying to review dozens of crappy specials and movies, and by the end of it I was almost ready to put my head through a brick wall? Nothing cheery about these Christmas stories. Would not recommend it. Though this collection of short stories was better than the other free books/short stories I've purchased on my nook, I still will not say it was very much worth reading. If the people want more, who am I to say no? With that in mind, I'm ready to announce something a little special this year. After slacking last year (three stories - really, I am embarrassed), I felt like I owed you a bit more this holiday. I'm a recent convert to Phineas and Ferb. The series is evocative of Dexter's Laboratory, almost to the point of feeling like a rip off. But - frankly - Phineas and Ferb eclipses Dexter's Lab. The show's concept may feel derivative, but its use of tone, subtlety, and complex characters built on a deceptively simple backdrop consisting of an intentionally repetitious formula make it stand out as one of the best animated series to come along in a long time. Fortunately, there are a couple of Christmas episodes: an extended special in season two and a half-episode in three. 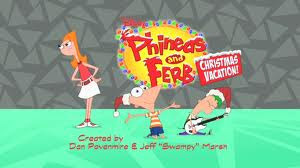 I'll tackle the short at a later date; for now, I'm focusing on the 33 minute "Phineas and Ferb Christmas Vacation". 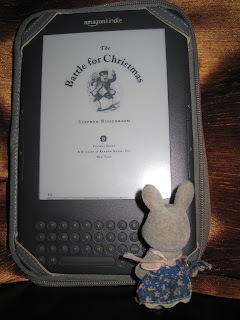 I found this book on a list of books tagged “Christmas” on goodreads. 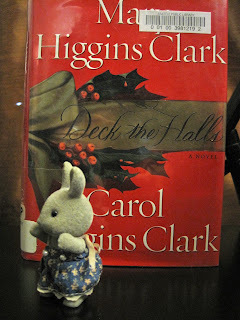 Apparently the Clarks, mother and daughter, have written a list of novels together all set at Christmas. Premise: Two successful novelists decide to cram all their popular characters together in the space of 200 pages. For Christmas. This book was an absolute mess. As I said above, it appears to be that both women took the protagonists of their successful suspense series and put them in a book together. This book is so short that you don’t get a sense of any of the characters, just told “this is person X and they are a Y” and the fact that you should care about them is assumed. The villains are petty and boring, the heroines sort of useless and bland. There are really useless, dull red herrings, and none of the sundry investigators do anything productive that actually leads to the resolution. Continuing our string of Christmas episodes on the "Christmas Cartoon Collection" from series I've never heard of, we reach "Gadget Boy's Adventures in History," which is apparently a spin-off of the series "Gadget Boy and Heather," which I've also never heard of. You may be asking yourself, "What the hell is Gadget Boy?" And the answer is, "You don't want to know." But since I'm a horrible person, I really want to tell you. Gadget Boy is basically a reboot of Inspector Gadget, only instead of being an incompetent adult cyborg inspector who's constantly being saved by a brilliant human child, he's an incompetent child android constantly being saved by a competent adult woman. In case you were still wondering, he's still voiced by Don Adams. Let's get one thing straight from the start. 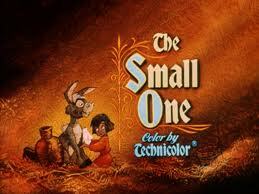 The Small One is an animated piece directed by Don Bluth (and very much in his style) when he worked for Disney. Nestor the Long Eared Christmas Donkey is a stop-motion special by Rankin-Bass. Both of these pieces are about the origins of the donkey who carries Mary to Bethlehem. Both of these pieces are not very good. However, The Small One is only mediocre, so compared to the steaming pile of excrement that was Nestor, Small One comes out pretty far ahead in the donkey-story quality scale. There are aspects of this special that aren't terrible, even. The story follows a young boy forced to sell his beloved but undersized donkey, who just wants to find his friend a new home. The animation is quite well done, both the boy and the donkey are cute, and there are some sweet interactions between them. 3) Try and game the system using the almost indistinguishable code of raised bumps on the back of the pack. 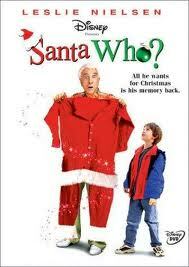 When you pick up a made-for-TV movie called "Santa Who", starring Leslie Nielsen as an amnesiac Claus who takes a job as a mall Santa, on a VHS tape for fifty cents, you brace yourself for what you assume will rank among the worse movies ever made. But I was actually pleasantly surprised. That doesn't mean this was great or necessarily even good, though it treads shocking close to that line. There are a few short sequences that are awful, several that make literally no sense, the entire ending is a mess, and the production values are just shy of what you expect from college film projects these days. 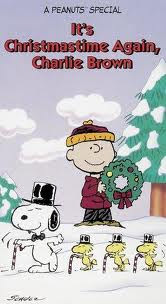 During the first year of Mainlining Christmas, we reviewed the original Charlie Brown Christmas Special. Well, Erin reviewed it. I sidestepped that one, in deference to the fact that my discomfort with it is rather personal. This, on the other hand, was just good fun. It’s Christmastime Again was released nearly 30 years after the first one. As an attempt to create another beloved classic it’s a failure, but as an animated Peanuts special, I found it solid. It’s an animated adaptation of several holiday-themed storylines from the comic strips; the half-hour special has no overarching plot. The upshot of this approach is that even if you don’t like the storyline about Charlie Brown selling wreaths door-to-door, you might like the one about Sally learning her lines for the Christmas Play, or Peppermint Patty and Marcie bickering about the same play. There’s a few nicely subversive scenes as well, which poke some fun at the original special. It was rather odd to find this on the DVD that claimed to be all animated holiday episodes. 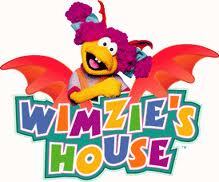 While intended for children, Wimzie’s House is a show starring puppets. Really boring puppets. Wimzie and her family are dragons, and Wikipedia helpfully identifies her friends as goblins and a troll, but they might as well have just been kids. Elmo is more of a monster than these guys. And probably smarter. 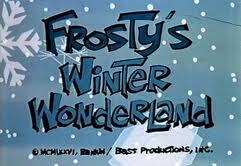 Frosty's Winter Wonderland is a sequel to 1969's Frosty the Snowman. Unlike Frosty Returns, Frosty's Winter Wonderland is actually a sequel to the original, complete with Jack Vernon returning as Frosty. Unlike said original, this is neither worth your time or attention. With the magician from part one absent, Jack Frost steps in as the villain, motivated by jealousy over a perceived slight: the children of this one particular town seem to like Frosty more than they like winter itself, despite the fact the snowy weather gets them out of school. 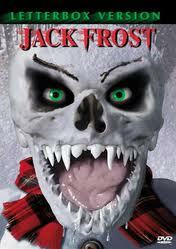 Naturally, Jack Frost decides to steal his rival's magic hat, transforming him back into a normal snowman. So, rather than move on to another town, he decides to go with murder. 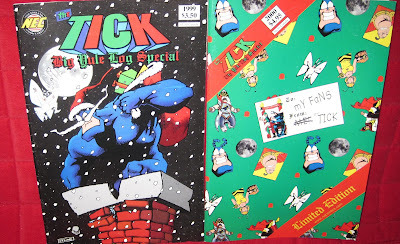 I’m going through my collection of holiday-themed back issues, looking at two issues every week until Christmas! In this holiday story, The Tick and Arthur head to New York for a Christmas party at the Superheroes-only Comet Club. Meanwhile, Barry (the wannabe Tick) hires a villain to crash the party so he can ‘save’ everyone and show up the Tick. This is a funny story, although I could have used maybe a couple more pages; it felt quite short. It was a great read though, with a downright heartwarming-ish speech from Tick, and ninjas hiding in the party decorations. 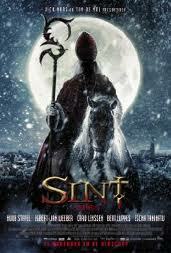 Saint (or "Sint") is a Dutch horror movie about a murderous zombie Saint Nicholas who descends upon Amsterdam every few decades to wreak havoc with an army of undead Black Peters when the full moon coincides with December 5th. The selling point for me was the promise of a killer Saint Nicholas, not just another Santa Claus. That sounded surprisingly gutsy: risking the rage of the Catholic Church on top of myriad family groups. Well, I wound up disappointed. While the zombie killer was an undead bishop named "Niklas," the film made it abundantly clear he wasn't Saint Nicholas of Myra, but rather some psychotic bishop from the late fifteenth century. On top of that, it was stated that Nicholas of Myra was a fictitious character invented to cover up the murderous crimes of this zombie. I guess that was done so they could tie his origin to Amsterdam and Saint Nicholas' Eve. Personally, I felt ripped off. I'm fairly certain this won't be the only time this song gets mentioned this year, but I wanted to highlight it somewhere it wouldn't be buried in a dissertation of holiday music. I came across this video on YouTube earlier this year. The song is from the album "Yulenog 3: Hardest Workin' Man in Christmas", which I promptly bought. I'll discuss the album in it's entirety elsewhere, but I really love this video and want to make sure everyone gets a chance to check it out. It starts slowly, but trust me - you want to watch the whole thing. 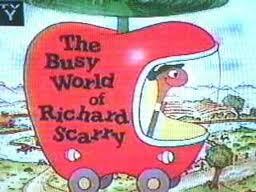 I had a bunch of Richard Scarry books when I was a kid. They featured anthropomorphic animals in either short, simple stories or in labeled pictures that taught vocabulary. I am not terribly familiar with this animated adaptation of said books. 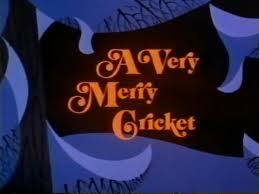 We found this Christmas half-episode on a DVD of various holiday cartoons. It’s two short stories that add up to under 15 minutes. The opening is cute and catchy, and some of the humor was kind of cute as well. This episode didn’t have much to recommend it to a viewer who was not a small child, though. This is a made-for-television special starring The Muppets, their cute little girl neighbor, and an array of celebrity cameos. 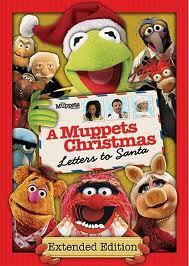 The cute little girl asks Gonzo to mail her letter to Santa, but hijinx at the Post Office prevent that from happening, so the Muppets put their various holiday plans on standby while they try to figure out how to get her letter through. Not a terrible premise, but nothing earth-shaking. If you’re anything like us, you’ll score this special on two separate scales. First, how good it is as a Christmas special, within the scope of Christmas specials. Second, how good it is as a Muppets special, within the scope of all things Muppet. On the first scale, Letters to Santa does rather well. It’s cute, funny, and at under an hour run-time, doesn’t overstay its welcome. On the second.... not so much. Seeing a young Betty White was even stranger than seeing a young George Burns in the Burns and Allen Show. Unfortunately, that dissonance was by far the best part of this thing. The respect I lost for White from her involvement in this show was quickly rekindled when I looked on Wikipedia for some context: it turns out this series suffered from interference from its sponsor, which resulted in any interesting elements being pulled. Apparently, Betty White has since disowned this thing, which absolves her of any culpability in my book. This is a half-episode story that follows Heathcliff and his sometime nemesis Spike on a jaunt to the North Pole to find out why their letters to Santa came back return to sender. There were some funny lines and some intriguing plot twists along the way. Everything gets resolved in maybe too pat a way, but Santa is well handled, the North Pole has a Seuss-like look that's pretty neat, and the disgruntled elf was a really fun and unexpected new character. While there might not be enough here to merit going out of your way to seek it out, it was enjoyable to watch, which is more than I can say for a lot of the holiday episodes we've seen. And it still has a really catchy theme song. Since moving out of New York, Lindsay and I have been frequenting used book stores, many of which have a surprisingly impressive selection of used Christmas merchandise. 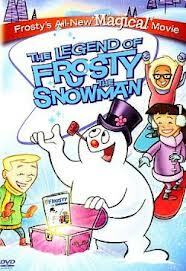 We found "The Legend of Frosty the Snowman" going for a buck in the clearance section of one and bought it. I'll admit it was a bit overpriced, but at least we didn't wind up paying something exorbitant - like $1.50 or $1.99 - for this piece of junk. The front of the box proudly advertises that the story is "Told and sung by Burt Reynolds." Before watching this, I wouldn't have thought that Burt Reynolds could sing. Funny thing: now that I have seen it, that hasn't changed. Fortunately, he only gets one chance, and that's (of course) Frosty the Snowman. It's actually the only song in the entire thing, though there are a number of musical montages that feel like someone was planning on putting a song in later but never got around to it. Premise: Non-Fiction book tracing the origins of American Christmas traditions, with emphasis on the shift from a more public-focused carnival Christmas to a more child-focused domestic holiday. I found this book really interesting, if a bit long. Nissenbaum is a little too enamored of his own narrative, and sometimes doesn’t completely back up his proposals with evidence. That said, all of the stuff that is corroborated is really interesting. Okay, I’ll admit it, I thought this one was cute. 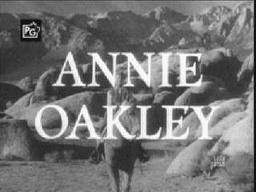 And not just because I’ve had an unreasonable affection for Annie Oakley since I chose her as my “person to dress as from history” in elementary school. I mean, that’s partially it. Excuse me, I have some Wikipedia-ing to do. Okay, I’m back, and now I have remembered my fully reasonable, founded affection for Ms. Oakley. Yay for historical levels of awesomeness. What was I talking about? Oh, right, the tv show. Not to be confused with Jack Frost (the animated short), Jack Frost (the Rankin/Bass special), Jack Frost (the family comedy from 1998), or any other Jack Frost production I'm forgetting, I just sat through the 1996 horror film. I use the term "horror" loosely: this is one of those campy horror/comedies that isn't remotely scary. Of course, it's no closer to being funny, but them's the breaks. 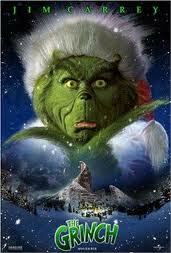 The movie opens with shots of a bunch of holiday ornaments while a voice-over sets up the backstory. This is really badly done and yet still somehow remains the high point of the movie, thanks to the fact everything that comes after it is utter crap. 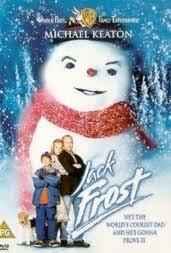 This is a movie from the 90's about a man coincidentally named "Jack Frost" who was killed in the aftermath of an automobile collision in a blizzard and is then reincarnated as a snowman, giving him an opportunity to fulfill some unfinished business in a small town. Please note that everything written above applies both to this movie and to the 1996 horror film of the exact same name. If you get confused, just remember that this is the one that's actually kind of creepy. Okay, do you remember the book A Cricket in Times Square? Me too. 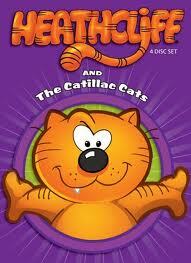 Do you remember the animated special adapted from the book, or at least that there was one? Yup. This is the holiday-themed sequel to that animated special. And it’s really quite good. We meet back up with our heroes from the first story: Harry the cat and Tucker the Mouse, who live in the tunnels near Times Square. Tucker is upset with how loud and angry everyone seems to be, even though it’s the holidays. The two mull it over for a while, then decide to get their friend Chester (the musical cricket) to return to New York to bring everyone a little Christmas Spirit. This is going to be the year of the really boring obscure specials, isn’t it? 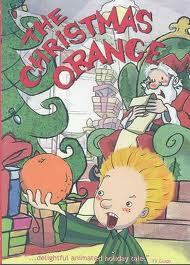 The Christmas Orange is a weird little piece from Canada based on a kids’ book. It’s about a kid named Anton whose birthday falls on Christmas, and he gets upset when he realizes that most kids get presents on their birthday and on Christmas, but he only gets one day of gift giving. (Incidentally, this is a totally acceptable gripe, but the proper way to deal with it is instituting half-birthday parties.) Anton asks Santa for 600 gifts, Santa brings him a nice shiny orange instead, and so Anton decides to answer a sleazy late-nite tv ad and sue Santa for breach of contract.